SUNLLIPE LED Torchiere Floor Lamp has a sturdy structure as well as a good appearance to fit bedroom, living room, kids' room and study. LED lamp is the trend of lighting which is more energy-saving than traditional lamps with incandescent bulbs. 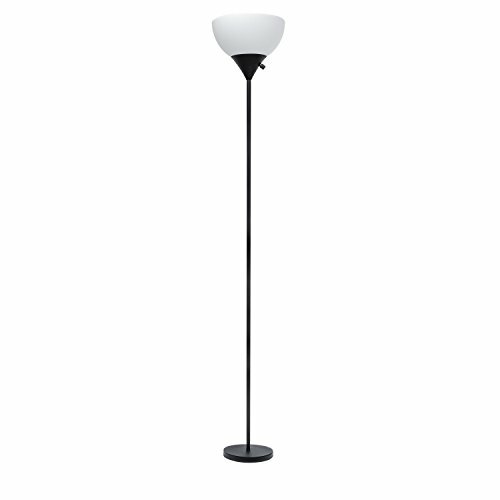 UL listed products provide you and your family with more confidence of safety,this torchiere floor lamp supplies warm light to make your room sweet. Solid Structure - This torchiere has a sturdy structure as well as a good appearance to fit bedroom, living room and study. Heavy 10" wide base, metal rod, rotary switch and white plastic shade with the cord(140" long) coming out from the base. Easy to assemble. More Safety - ETL listed products provide you and your family with more confidence of safety. With the built-in 9W 3000 Kelvin LED lights, this floor torch light supplies warm light to make your room sweet. And the shade would never get over hot to burn. Energy Saving & Versatile - The energy-saving 9-watt led floor light fits any décor. This uplight lamp is of modern sleek style, and its lightweight design makes it easily portable from room to room. Free from a Burnt-out Bulb - Different from traditional incandescent lights, this floor torchiere is with durable built-in LED light. Help you save money and never get frustrated by burnt-out incandescent bulbs from time to time. Warranty - SUNLLIPE provides 1-year worry-free warranty. If you have any questions about the item or anything makes you unsatisfied, please contact us immediately. Our support team will be back to you in 24 hours.